I hope all of my U.S. friends had a wonderful Thanksgiving! 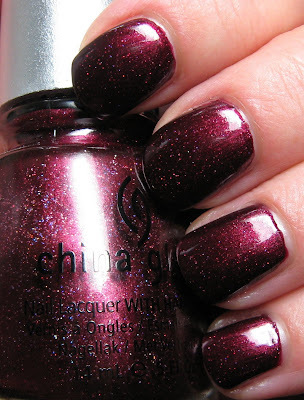 Today I've got 2 more shades from the China Glaze 'Tis the Season Collection to show you and to give away! I've also included one of the high fashion Holiday Ballz necklaces that China Glaze includes with the Celebrate in Style gift sets. Your ballz are sure to be the envy of everyone at the Holiday parties this season! Below: Naughty and Nice is a high gloss jelly vamp creme that reminds me of one of my all time favorite discontinued China Glaze shades, Dripping Wet. Naughty and Nice applies much better though, as I used 2 coats and the coverage was fantastic, unlike the old school Dripping Wet formula. This is a beautiful deep rich wine shade and less red than Dripping Wet. Below: Sugar Plums is a glowy burgundy or deep red shimmer filled with tiny multi colored glitter. Oddly, this too reminds me of another favorite discontinued China Glaze shade, Crystal Ball. This is sort of a darker version of that shade. Again, only 2 coats and great coverage. If you'd like to enter for a chance to win both of these shades and the fab ballz, just leave your eMail in the comments section below. I'll leave the contest open until I post on Monday, at which time the winner will be announced. How many of you braved the Black Friday crowds?!!! *Polishes featured were furnished by the manufacturer or PR firm for review. we don't have black friday here, probably because we don't have thanksgiving, but I'm not really sure! Hello, thanks for the great giveaway! After watching the weather this morning, I decided to stay home and shop online. Both of these are gorgeous colors. Hope you had a good Thanksgiving. hi awesome giveaway--no money to act a fool with on black friday--watching it on the news ps a woman threatened violence at toys r us *lol* enter me pgreenlee@wi.rr.com.....ttyl! And I didn't go on Black Friday due to my anxiety with large crowds lol. I sent my boyfriend out but it was only for a memory card for my camera lol. I'm back from shopping (just went to Target(family/friends) and Ulta(for me))! Love to enter this giveaway: tigirlyly@gmail.com. Oh, I wish we had something like Black Friday. Seems crazy - and that's fantastic! Thanks For the giveaway. We don't have black friday in the uk but it's really dark and snowy - and I got to take advantage of sales on my favourite indie shops ! I follow you with that address aswell! Ooh, those are gorgeous colors! Wish we had something like Black Friday here aswell. Lovely giveaway! We don't have black friday over here. At first I didn't even know what it was ;) but now I do. Have a nice weekend! Avoided it like the plague and slept in. Naughty and Nice is so vampy! love it! I can't face the madness on Black Friday, so I stay in! My email is kirby.monk (at) gmail (dot) com. I braved the crowds and survived! Thanks for this giveaway ! No Thanksgiving and black friday in my country. But I had a very bad friday, someone tried to steal my car ... this is a black friday ! Thank you for an awesome giveaway, please enter me too! Have a great Black Friday!! happy holidays, thanks for the giveaway. Such gorgeous colors! I would love to be entered. Once again it's fabulous !! Love love love these colours! Thanks so much for the giveaway...my email is mychihuahuabites16 at gmail dot com! we don`t have black friday....I did do a little purchase in internet..does that count as well?! Ooo, gorgeous colors - especially the first one! My Yahoo email is waschbare. Thanks! No Black Fridays for me! I hope my dad managed to keep my mom from going shopping today. She's so small and the crowds are so crazy! Wow, these are real beauties ! Sugar Plums more original maybe but still. I'd love to have them both. i didnt brave any black friday sales actually, although i might go out later, im more exited for cyber monday! Black Friday at the mall was FANTASTIC. It was really no more crowded than say a Friday night at the mall would be. And nearly EVERY store had 40% or 50% off EVERYTHING with no restrictions. It was AMAZING! Hope you had a great Thanksgiving ^^. beautiful swatches. i stayed in the house this BF!!! Went out this morning after only 3 hours of sleep. So tired! I did! But I didn't start shopping til 5- I didn't start at 3 am like last year! Today was the first Black Friday ever that I ventured to the mall. Hey, 40%-50% off isn't too shabby! I follow via GFC with my GMail address and can also be reached at extemter at hotmail dot com. I didn't do the black friday this year, because I don't have my passport to go across the border this year. I went two years ago and got a pair of jeans that where regularly 60 for 10 ! nice eh ? Would not be able to make it through with my sanity in tact with all those crazy crowds, so I don't even attempt it! Thanks for the giveaway. I love the Sugar Plums. No Thanksgiving here so no Black Friday either! Please include me in the giveaway. These are two gorgeous polishes! I stayed home and bought some polish from Nubar. I probably missed tons of good stuff. I just screwed up my knee again. I hurt it two weeks ago and now I re-injured it. I can barely walk. I'm just whining. Sorry. No black friday for me. Happy Thanksgiving anyway! I did some late shopping. Lovely giveaway! My e-mailadress is dwmpunt [at] gmail [dot] com. No black friday here (no thanksgiving) and I had to work yesterday! Didn't make it to Black Friday mayhem...would have liked to, the craziness is a bit fun. lovely! we don't celebrate thanksgiving over here. Nice giveaway :)! have no clue what is Black Friday (we don't have Thanksgiving in Italy) though it sounds somewhat cool..
Gorgeous Giveaway Mary. Would love to own one or both. Dripping Wet is so gorgoeus! 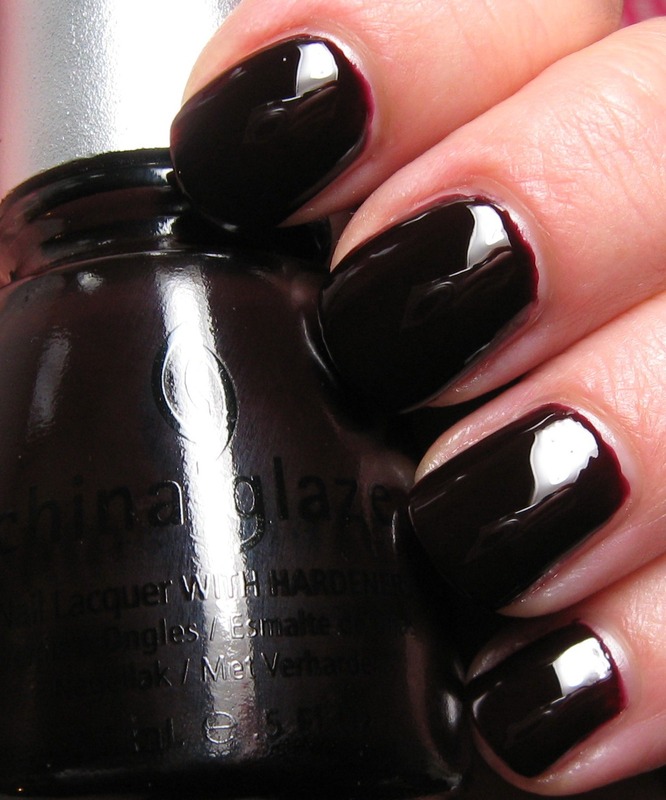 Looks smashing on your nails and love Crystal Ball, China Glaze has some of the best colors for Winter! This contest is so cool and nice of you to do for all your loving fans. I got a tattoo on a black friday sale... saved me 300 bucks which I will undoubtedly spend on nail polish,lol. Please enter me in the CG contest! My email is helllo.mundo@gmail.com (yep, hello is intentionally spelled with three 'l's instead of two). No Black Friday crowd-braving here! But I shopped a bit online - for nail polish (surprise, surprise! ;-D)! LOL! Thanks for doing this - and for the fantasitc blog!!! Naughty and Nice looks really nice. Thanks for the giveaway! We don't celebrate thanksgiving over here. I worked a 14 hour shift on Black Friday! Boo! Every year I say never again but I always seem to be there. Hello! I would like to enter the giveaway :) My email is: HoneyKatt21 (at) aol (dot) com. My Google Follower name is HoneyKatt21. Thanks and Happy Holidays!